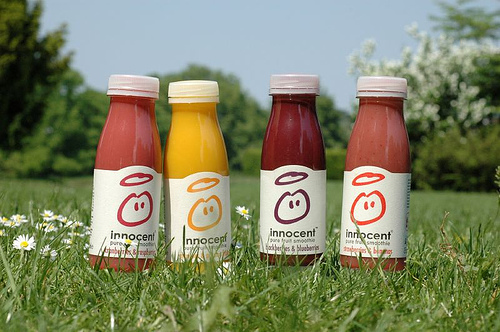 Innocent Drinks is a UK company that was founded in 1998 by three Cambridge graduates. It has grown into the number one smoothie brand in England. Their revenue now exceeds 100 million pounds. Richard Reed, Jon Wright and Adam Balon started Innocent after successfully selling smoothies at a music festival. While selling drinks at the festival, they put up a sign asking people if they thought they should give up their jobs to make smoothies. They put up a bin saying “Yes” and bin saying “No” in front of their booth. They got people to vote with their empties. At the end of the weekend, the Yes Bin was full, so they resigned from their jobs and built a brand. I became aware of Innocent Drinks last year when I read Jim Stengel’s book “Grow”. The fundamental premise of Grow is that successful companies are organized around Brands Ideals, a shared purpose of improving people’s lives. Companies that organize around a shared goal of improving people’s lives are the fastest growing businesses. Innocent is a brand built around the ideal of trying to make people healthier. Innocent was formed with the very simple idea that every product contains 100 per cent pure, fresh ingredients and no fruit concentrates. Their brand purpose is to make natural, delicious food and drink that helps people live well and die old. They demonstrated a commitment to a brand ideal, a consumer focused purpose and a culture that encouraged creative thinking. They developed a business based on sustainability and doing the right thing. They donate 10% of their profits to fund rural development projects in the countries where their fruit comes from. They wanted to make it easy for people to do themselves some good. And to leave the planet a little better than they found it. Innocent is a values driven organization. Their five values reflect what they are, how they try to do things, and want they want to be in the future. Be Natural – Not just our products, but being natural in how we treat each other and how we speak to the most important people – our drinkers. Be Entrepreneurial – innocent began as a small, entrepreneurial company, and nothing much has changed. We aren’t afraid to do things differently, and we’ve never given up on a good opportunity. Be Responsible – We keep our promises, are mindful of our impact on our community and our environment, and always try to leave things a little bit better than we found them. Be Commercial – We wouldn’t be here if we didn’t keep our eyes on the numbers at all times. Ultimately we want to deliver growth for us and our customers too. Be Generous – This means giving honest feedback to one another, taking time to say thank you, and where we can, donating our resources or money to those who need it more than us. It’s that simple. Is you company or brand organized around a shared goal of improving people’s live? This is great, Mark. Hopefully they migrate to the ‘States! This post reminds me of the latest Entreleadership Podcast by Dave Ramsey’s crew (titled: “Selling by Serving with Lisa Earle McLeod”). They talked a lot about how the best salesmen are the ones who truly believe in their product and feel their product has a real purpose. Sounds like the Innocent brand embodies that too.